As Congress faces an April 28 deadline to fund government operations, the public is now split in their general preferences on the size and scope of government: 48% say they would rather have a bigger government providing more services, while 45% prefer a smaller government providing fewer services. This marks the first time in eight years that as many Americans have expressed a preference for a bigger as a smaller government. Support for bigger government has increased 7 percentage points since last September, when more said they preferred a smaller government offering fewer services (50%) than a bigger government providing more services (41%). The last time the public was divided on this question was in October 2008, just prior to the election of Barack Obama. The partisan gap in views of the size of government remains as wide as ever. About three-quarters (74%) of Republicans and Republican-leaning independents say they prefer a smaller government providing fewer services, while just 21% want a bigger government. Views among Democrats and Democratic-leaning independents are nearly the reverse: By 65% to 27%, more prefer a bigger government with more services. The national survey by Pew Research Center, conducted April 5-11 among 1,501 adults, also finds broad support for maintaining or increasing federal spending across 14 specific program areas. And public support for increased spending across most programs is now significantly higher than it was in 2013, a time when public concerns about the budget deficit were on the rise. For 11 of the 14 program areas included in the survey, greater shares now back increased spending than in 2013. The public expresses broadest support for increased federal spending on veterans benefits. Overall, 75% say that, if they were making up the budget for the federal government this year, they would increase spending on veterans benefits and services; 21% say they would keep spending the same, while just 3% would decrease spending. Two-thirds (67%) say they would increase spending for education. And as the president and Congress consider plans to address the country’s infrastructure, 58% say they would spend more on rebuilding highways, bridges and roads. On a range of other programs, there is widespread public support for either increasing spending or maintaining it at current levels. For example, 50% say they would increase spending on health care, while 29% would keep it the same; just 18% say they would cut federal health care spending. Similarly, when it comes to military defense, 46% would increase spending and another 32% would keep spending as it is (20% say they would decrease spending). As in the past, the public shows little appetite for spending cuts. Majorities say they would either maintain or increase spending for all 14 program areas included in the survey. Support for increased spending is the lowest for government assistance to the unemployed (29%), economic assistance to needy people around the world (29%) and spending on the State Department and American embassies (15%). Nonetheless, in all three of these areas, pluralities favor keeping spending the same as it is now, with no more than a third say spending should be cut. The public has long been skeptical of cutting spending for specific government programs. But support for increased spending is significantly higher across most programs than it was four years ago. The share saying that they would spend more on veterans benefits is up 22 points from February 2013 (from 53% to 75%). There has been a comparable rise in support for more spending on rebuilding highways, bridges and roads (up 20 points from 2013). Greater public support for increased government spending also extends to other program areas. 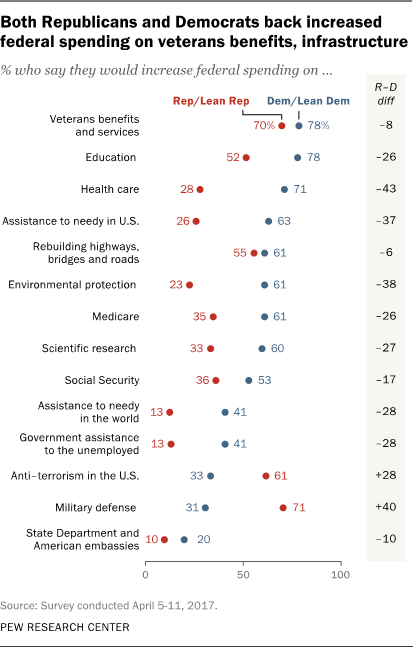 Compared with 2013, more Americans want to increase federal spending on aid to needy people in the U.S. (up 18 points), anti-terrorism defenses in the U.S. and military defense (both up 14 points), environmental protection (up 13 points) and scientific research (up 11 points). Government spending on Social Security, assistance to the unemployed, and the State Department and American embassies are the only three programs (out of 14) for which there has not been a significant rise in support for increased spending since 2013. 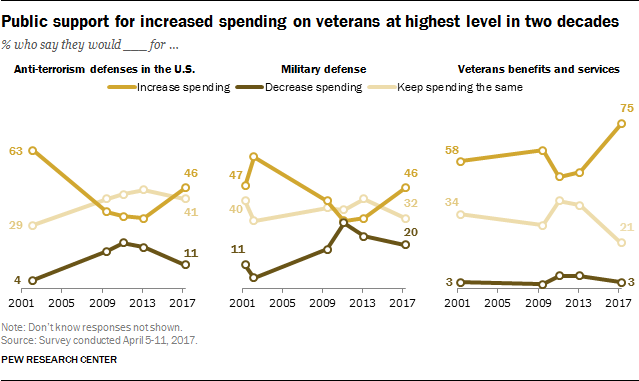 Public support for increasing spending on veterans benefits and services is now at its highest level since Pew Research first asked the question in 2001. The shares that back increased spending on military and anti-terrorism defense are both up in recent years, but are lower than they were in 2002, in the wake of the Sept. 11, 2001 terrorist attacks. Reflecting their overall disagreement on the size and role of government, Democrats are far more likely than Republicans to favor increased federal spending in most specific areas. 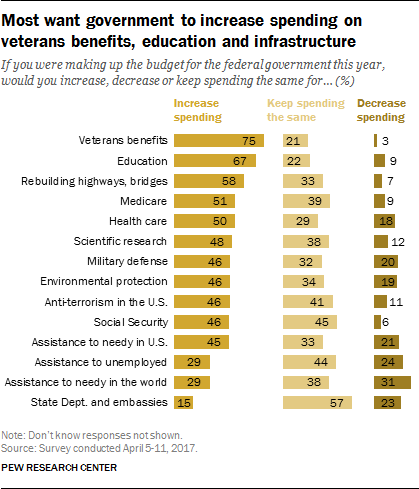 However, on spending for veterans benefits and infrastructure improvements, similar majorities of both Republicans and Democrats back increased spending. Nearly eight-in-ten Democrats and Democratic leaners (78%) and 70% of Republicans and Republican leaners say they would increase federal spending on veterans benefits and services. Most Democrats (61%) and Republicans (55%) also support more spending on infrastructure improvements. But far more Democrats than Republicans favor increased spending for aspects of the social safety net. For example, 71% of Democrats and Democratic leaners say they would increase federal spending on health care, compared with 28% of Republicans and Republican leaners. And while 63% of Democrats favor increased spending on economic assistance to needy people in the U.S., fewer than half as many Republicans (26%) favor this. In many other areas as well, including environmental protection, scientific research and education, there is much greater support for higher levels of spending among Democrats than Republicans. Yet while Republicans are less likely than Democrats to back increased spending on 11 of the 14 program areas in the survey, there is only one for which a majority of Republicans support spending cuts. Most Republicans (56%) favor decreasing federal spending on economic assistance for needy people around the world; just 13% of Democrats would cut spending in this area (45% would keep it at its current level and 41% favor increased spending). Military defense and anti-terrorism defense are two of Republicans’ top spending priorities, and two programs for which they are more likely than Democrats to back greater spending. About seven-in-ten Republicans (71%) would spend more on military defense, compared with 31% of Democrats. On U.S. anti-terrorism defenses, 61% of Republicans and 33% of Democrats say they would increase federal spending. Anti-terrorism and military defense are two exceptions to this pattern: On these two issues, partisans have diverged in their support for increased government spending. 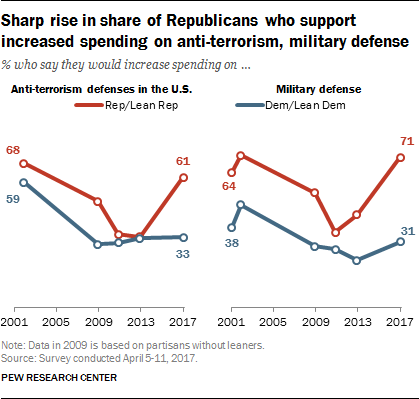 In 2013, nearly identical shares of Democrats and Republicans (33% each) favored increased spending on anti-terrorism defenses in the U.S. In the current survey, however, there has been sharp increase in Republican support for more spending on anti-terrorism (to 61%), while Democrats’ views are unchanged. Similarly, while Republicans have long been more likely than Democrats to say they would increase spending on military defense, the gap between partisans on this spending priority has widened over the last several years. In 2013, there was a 22-point gap between the shares of Republicans (44%) and Democrats (22%) who said they would increase military defense spending. Today, that gap is 40 points, with 71% of Republicans and 31% of Democrats each saying they would increase spending on military defense. 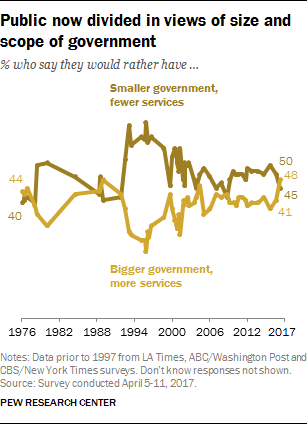 For the first time in eight years, about as many say they would rather have a bigger government that provides more services (48%) as say they’d prefer a smaller government providing fewer services (45%). Since last September, overall support for bigger government is up 7 percentage points and this shift is seen across most demographic groups. Majorities of adults 30 years old and younger (57%) and ages 30-49 (54%) say they would rather have a bigger government providing more services. Fewer adults ages 50-64 (38%) and adults ages 65 and older (40%) say this. Those with family incomes of $75,000 or more are much less likely than those with lower incomes to say they’d prefer a bigger government that provides more services. Just about a third of those earning $75,000 or more (35%) say this, compared to 44% of those with family incomes between $30,000 and $75,000 and nearly two-thirds (64%) of those making less than $30,000 a year. As has long been the case, there is a wide partisan divide in views of the size and role of government. Nearly three-quarters of Republicans and Republican leaners (74%) say they would rather have a smaller government providing fewer services. Most Democrats and Democratic leaners (65%) say they’d rather have a bigger government that provided more services. The partisan divide on this question is not much different than it was in September, when 80% of Republicans backed a smaller government and 63% of Democrats favored a bigger government.